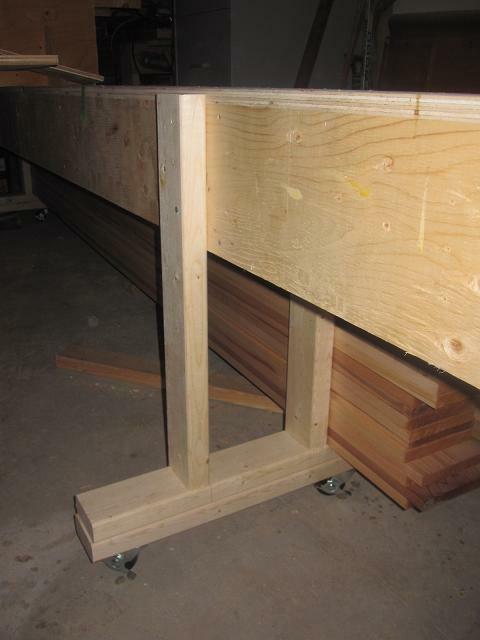 A quick word on mounting the station forms (and perhaps canoe-building in general) — double-check. And after you have double-checked, take a break and check again. Turns out that although the forms all lined up at the top, form 6 (the one that holds the bow or stern form) was not perfectly aligned. My assumption was that the form’s centerline was square to the base of the form; as a result, all would be square and true. Wrong. What is it they say about assumptions? Something about making crooked canoes. 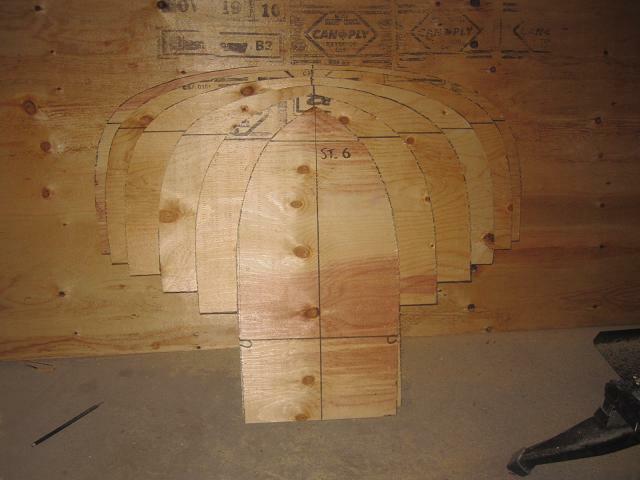 I made sure that the strongback was square and level, and then I went about checking all of the forms for trueness. Turns out that form 6 was about 4 degrees out of true. Perhaps the template slipped when I traced the form. Perhaps my centerline was a little off. If I hadn’t caught it at this point, the bow (or stern) would have had a twist. The picture below shows the laser level against the form. Finding this potential problem at this stage allowed me to fix it and check again that the forms lined up along the keel and — more importantly — were true along the horizontal and vertical axes. Disaster averted. Now it’s time to make some sawdust. 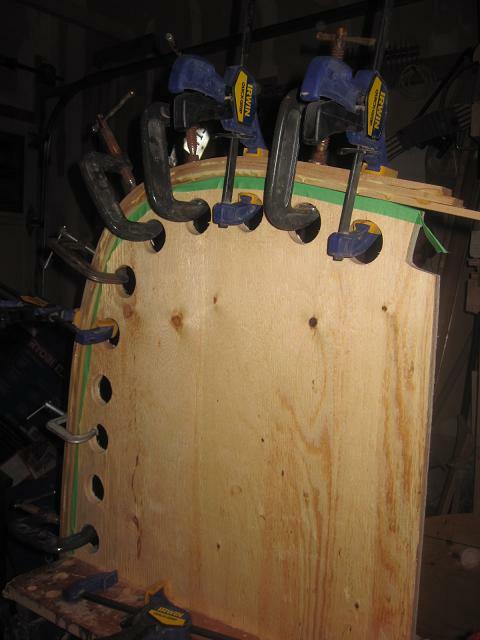 Before mounting the forms permanently to the strongback, I tack them on using brad nails. This keeps the forms in place but allows me to fine-tune their position. 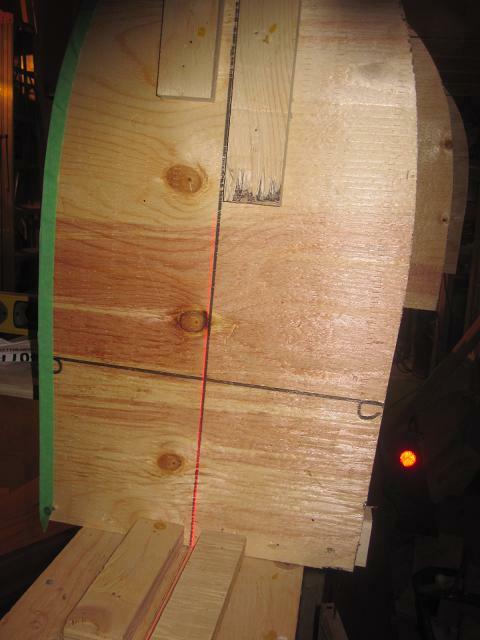 When all the forms are in place, I use a laser level and run the beam along the centerline of the forms. In this way, it’s easy to see if any of the forms are out of alignment. Then I look along the lines that represent the waterline of the canoe. They should all line up. If one is lower or higher, the canoe will have a bump. At this point, I permanently screw the forms to the strongback. More for my own peace of mind than anything else, I then measure from bow to stern on the port side and again on the starboard side. Both measurements should be the same. If not, something’s off — perhaps the bow or stern forms are not properly aligned, or one of the forms is off somehow. That’s essentially it for mounting the station forms. I again invite my family to admire the progress. Wow, they say. It’s big, state the more verbose of the bunch. I”m happy though. This is another one of those milestones in building the canoe. Right now it looks like a skeleton, but in my mind’s eye I can picture it sheathed in cedar strips. Now it’s time to transform those cedar planks into strips and make some sawdust! Internal stems are what the strips are attached to at the bow and stern. They can be made out of a solid piece of wood, but it’s easier to laminate several strips. These strips are bent around the bow and stern forms. When you’re stripping the canoe, the stem gives you a good surface to glue the strips to at the ends. Internal stems are also important in terms of strength and helps the canoe better handle impact. Because the internal stem is hidden within the boat, its appearance is less important than that of the external stem. As a result, I’ve decided to experiment. I had some strips of white cedar left from the previous build. The stock is perfect for the internal stem in that its soft and bends easily. I’ve also used pine in the past. I don’t have a steam box and don’t really feel like building one. That said, I know that cedar typically responds well to the heat gun. It’s still a little nerve-wracking to wrap the cedar around the bend of the form, expecting at any moment to hear the tell-tale crack of wood that has been overstressed. For the first internal stem, I stack 3 knot-free strips of 1/4 inch white cedar. Instead of doing one strip at a time, I apply glue between all of the strips at once and apply heat. I gradually tighten the strips against the form, heating all the while. Just as I tighten the final clamp, I hear the wood splintering. When I investigate, there are a series of small splits in the wood on the edge where material. Because the edges will be planed off anyway, I decide to leave it. 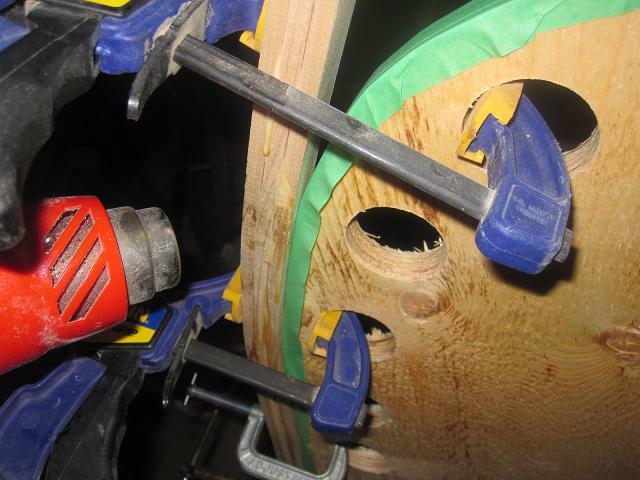 …and add more clamps and pressure as I work around the curve. No splintering. In fact, the wood is bending smoothly and easily. The final result looks pretty good. Note that I’ve taped the form. This is to prevent the stem from sticking to the form. Before I begin stripping (the canoe), I’ll tape the edges of the station forms as well. I’ll let the stems dry before planing the edges and mounting the end forms to the strongback. I’ve started mounting the forms, but before I get into that, I’d like to highlight some modifications that I’ve made to the strongback for this build. First of all, space is at a premium. So to give me a little more flexibility, I’ve installed lockable wheels so that I can roll the strongback where needed and lock them when I don’t want it to move. Hopefully this will help me avoid some of the awkward contortions I subjected myself to in my last build. As well, the new version of the strongback has a shelf that should come in handy for tools or if I’m scarfing several strips and need a long surface to rest them on. I accomplished this by extending some of the station supports 12″ over the edge of the strongback. By the way, there’s a lot of information on the web and in Ted Moores’ “Canoecraft” on building a strongback. The one I have is perhaps a bit narrower than most at 8″, but has the advantage of having been built out of one sheet of plywood cut into six 8″ strips. The internal spacers and supports where made out of scrap material. Tracing and cutting the station forms is when the canoe building project becomes real. This step requires tracing the forms onto plywood and then sawing them out using a jigsaw (or bandsaw, which I unfortunately don’t own <yet>). 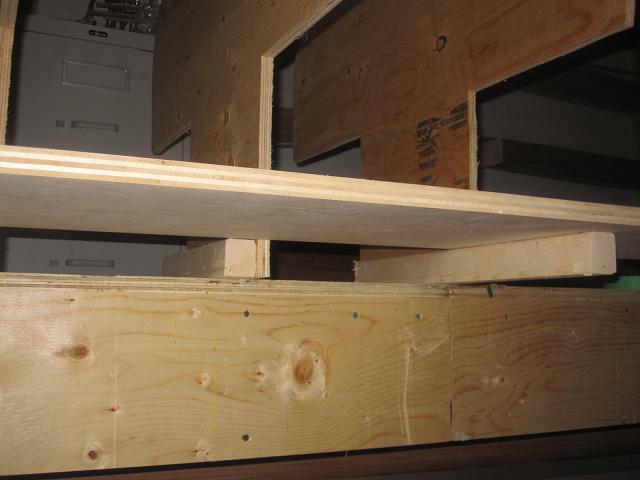 The forms need two sheets of plywood. 1/2″ is probably okay, but I prefer 5/8ths. 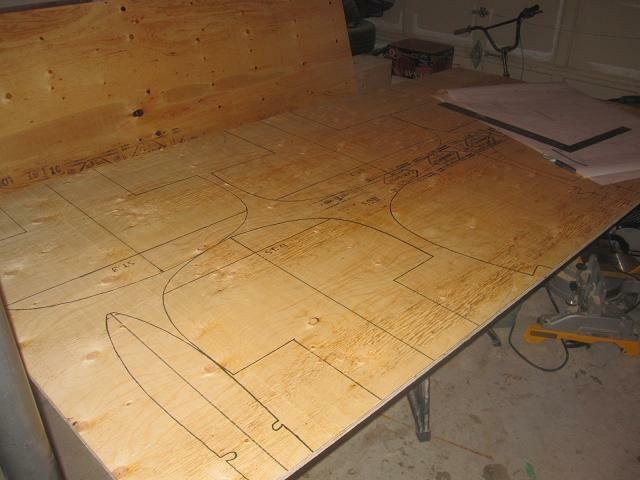 To transfer the template to the plywood, I need carbon paper. This is actually the first time in 30 years in which I’ve used carbon paper. I was amazed that office supply stores still carry the stuff. I see its continued existence as a sign that the almighty is smiling upon my project. The kids are amazed by the stuff for about 10 minutes, at which point they return to their video games. I’ve more or less cut toward the outside of the line with the intention of sanding down any rough edges later. It’s remarkable though how often the jigsaw seems drawn to the line, thereby transforming any useful reference into sawdust. After cutting the forms, I invite everyone in the house to admire my stack of plywood. After all, this is the beginning of a great adventure. At this point, I’m excited. It’s the first of many milestones. My family rolls its eyes. They’ve heard it before. There’s something magical about transforming a pile of lumber, some glue, and some fiberglass into a canoe. After having built a kayak, it dawned on me — belatedly, of course — that unless I built a veritable fleet of kayaks, some members of my family would be watching the fun from shore. So I decided to add a canoe to the small fleet using some of the hard-won lessons from the last kayak build. 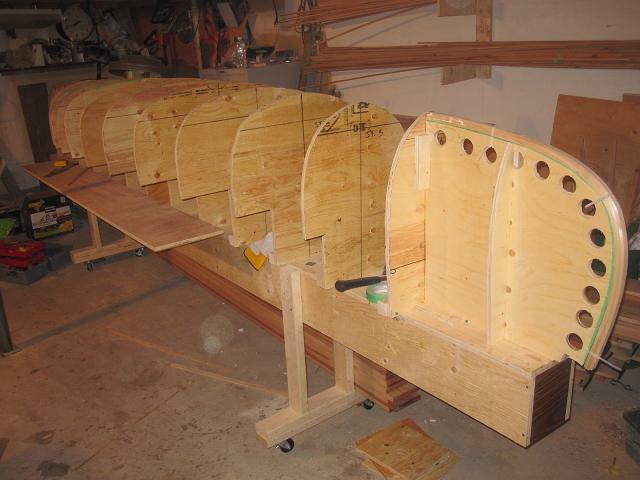 This blog details the steps of the build, from pile of lumber to (hopefully) beautiful canoe. Over the next few weeks, I’ll be writing about the process of building a cedar strip canoe. Part of the reason for the blog is to force me to keep track of the time and expenses involved. Another reason is to maintain a record of the process. The biggest reason is to add to the body of online information. I’ve benefited greatly from the trials and tribulations of other canoe and kayak builders. If highlighting my mistakes (and I will make them) helps others avoid those same mistakes, then I’ll consider this blog a success. As part of this account, I’ll be keeping a running tally of the time and expenses. I tend to under-estimate both. A running tally will keep me honest. You are currently viewing the archives for January, 2011 at greybeard canoes & kayaks.